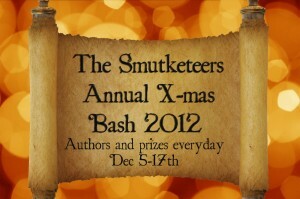 We are thrilled to be a part of the Smutketeers Xmas Bash this year! Head on over today, it’s blogger day! You’ll get to read more about us as well as other bloggers. And the best part? This event has an amazing Grand Prize… $200 Gift Card!! You must comment on each of the 12 day’s posts in order to be entered to win the GRAND PRIZE-a $200.00 Gift Card!-at the end! Click here to go to our post. Sounds fun thanks for the FYI. I was over there earlier today.